Croatia has a coastline along the Adriatic Sea, the body of water that separates it from the so called “boot of Italy”. Beautiful beaches follow the shore and this is also a great locale for diving. In addition to the shoreline, there are sixty-six islands where most of the best diving takes place. Water temperatures range from low of 7 C during winter, to around 24 C in the summer. But temperatures of the seawater can differ from one area to another. There are freshwater springs bringing cold streams up from the ocean floor even in the summer months, so it’s a good idea to have your full gear ready. In Croatia, diving is possible between May and November, with the quietest months being September and October when the water is still warm. At Rogoznica there is an underwater wreck standing at about 48 meters. It is possible to still see a cargo of explosives on board. At the busy tourist town of Podgora an hour and a half drive down the coast from Split, you can take a boat to Zut Kamen which is about 300 meters off shore. The water is cold with thermoclines at 10 meters and 13 meters. The dive includes two rocky outcrops at 9 and 15 meters. The rare giant mussel which is unique to the Mediterranean Pinna noblis, may be found in these waters. It is one of the largest in the world growing to 120 cm in length. You can see it sticking out from the sea bed. Also present are fresh water springs coming out from the sea floor, and large schools of blue nudibranch-Facelina auriculata, feather stars and even octopus can be seen. Down the slope there is a cave entrance with a larger cave at 25 meters. The cave includes a fresh water spring. The water is cold and blurry. Purple Bay at Island Brač is the place where you can dive among seahorses and even sharks. There are four drop-offs at this location, each a separate dive site. A variety of plants and animals can be found in the many holes and notches of the rough surrounding walls, including scorpionfish, gold sponges, sea fans and others. Be sure to keep an eye out for the spotted shark, very impressive with a length of about 1.20 m. This is a good site for rebreather and nitrox divers. 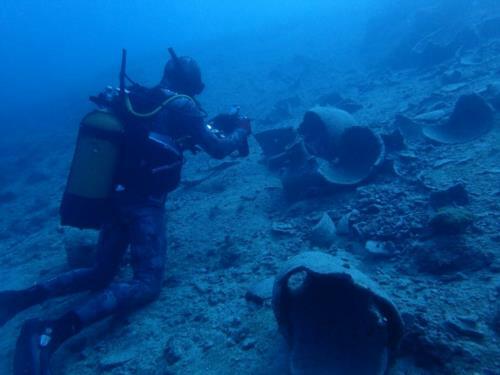 Diving sites at Island of Hvar offers a long field of old amphoras stretching along depths of 12 to 20 meters. These amphoras once belonged to a Greek ship that ran aground and lost its cargo. Now it serves as a shelter for a variety of fish with the neighboring seagrass fields acting as a home for many sea slugs. This diving site also includes a stony reef with many small caves all located north of Hvar Island. Another exciting dive site is Vruja at Makarska Riviera, near Tučepi, with a cave at a depth of 30 m surrounded by a wall of purple vegetation. Canyons open up to a depth of 100 meters making it a good site for even trimix divers. The canyons begin at 30 m and at 50 m you can see a school of hake fish including about fifty members. Dalmatian region of Croatia has a wide variety of good and interesting diving sites. If you decide to give it a visit, accommodation in Croatia can be found and arranged online. Majority of diving enthusiasts there are well versed in English, so language isn’t much of a barrier to get advices, rent gear or find diving partners. Wilmington, NC $DIVE BUDDY WANTED$ anyone know the best spots?